With so many similar phones on the market this could be a tough sell. However, with elements like a microSD card slot to back up the 8GB of onboard storage and nearly all the HTC goodies bar the Ultrapixel sensor on offer, the Desire 601 is a pretty decent device. The HTC Desire 601 is another phone to confuse consumers who recognise the once-great name in a phone – but does it have hidden treasures below the numerical moniker? The phone is one of those that fits into an invisible gap in the market: with the HTC One Mini and the Desire 500 already filling (or set to fill) the shelves of your local phone emporium, it's hard to see the appeal of the 601. The design is, at least, fairly pleasant, with the rubberised polycarbonate shell surrounding the 4.5-inch qHD screen in a way that means it sits nicely in the hand. It feels comfortably mid-range; by that we mean the materials don't feel premium but it has a good balance to it so it doesn't give the sensation of a shoddy build. The raised volume keys are a nice addition too, making it much easier to raise the and lower the noise coming out of your device compared to the One. HTC's flagship phone might have been great-looking, but the flush volume rocker rankled some users thanks to it being hard to find without looking. The Desire 601 option might be plastic, but at least the keys are discrete and much easier to locate with your eye-less digits. If you've used the HTC One or the One Mini then the Desire 601 will have a strange sense of familiarity to it, as it packs the BoomSound speakers on the front of the phone, although there's a feeling that the sound emanating isn't quite as powerful as we've seen on the One series. It's a decent feature to have on what will be a mid-range phone, so it's good to see that HTC is plugging away with its proprietary technology in phones other than the One range. Beats Audio is also on board, and while this is more of a software addition (we couldn't find any trace of an amplifier specifically for the headphones to help with the sound flowing to your ears, although there is one in there 'to help with BoomSound') at the lower end of the market it's going to be a good option to help sell the device to the younger demographic that this phone is aimed at. In terms of using popular elements of the HTC One, we're glad to see BlinkFeed on offer as well for a range of news and social media feeds – if it weren't for the vastly different make up of the chassis, you wouldn't be able to tell the Desire 601 from the One, such is the similarity of the Sense 5.0 overlay. However, it's interesting to note that despite coming with the HTC Image chip and being able to capture Zoes (and thus create video highlights using the 3.6-second clips captured in place of photos) there's no UltraPixel sensor on offer here. While the HTC One and One Mini have a 2.0µm pixel size sensor, there's only a 1.4µm option here, meaning that less light can get into the camera and therefore picture quality is lower. However, with a 5MP camera with an f2.0 aperture, the pictures shouldn't end up atrocious, and in our tests we found that the shutter speed was more than acceptable. In terms of overall speed, the metrics here are two-fold: HTC is extolling the fact the Desire 601 is an affordable device that features a 4G chip inside, and while we couldn't test the next-generation speeds, it's good to see that the connectivity is permeating down to the lower end of the smartphone market. However, in order to achieve that cost level, HTC has dropped the speed of the processor to a dual-core 1.4GHz Qualcomm 400 chip, combined with 1GB of RAM, which isn't as high-powered as the quad-core option found in the Desire 500. However, there doesn't seem to be an issue with speed when using the Desire 601, with every app we tested opening and closing quickly. There was a definite lack of snap compared to the larger One with regards to screen response, but we can understand the downgrade in search of a lower price point. 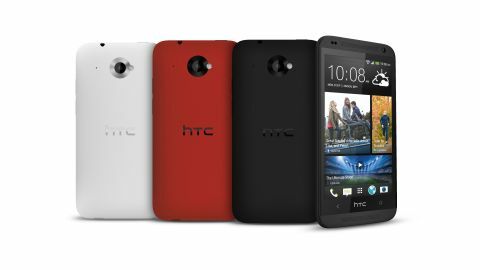 HTC refused to give an idea of how much we can expect the Desire 601 to retail for, neither on contract or in SIM free variants, but it should sit a tier or two below the HTC One Mini and thus be available at the more favourable end of the mid-range, with PAYG options likely to be palatable. HTC is an odd company, in that it excels in making phones that can so easily sink below the radar of many consumers. For a company that's pledged to make fewer phones, it's come out with a large amount this year thanks to the One, One Mini, Desire 500, Desire 601 and Desire 300 – plus the HTC One Max on its way too in all likelihood. It's hard to see which consumers will plump for the Desire 601 unless it gets a huge marketing boost – there's still not enough appetite for 4G speeds on a mobile to make it the reason to buy a phone and that seems to be HTC's ploy. It's certainly one that resonates with networks, and may serve to bring enough carrier spending to push the 601, but with so many similar phones on the market this could be a tough sell. That said, with elements like a microSD card slot to back up the 8GB of onboard storage and nearly all the HTC goodies bar the Ultrapixel sensor on offer, the Desire 601 isn't a phone shorn of quality – so here's hoping it doesn't join the Legend, Incredible S and One V on the 'do you remember those HTC phones? Whatever happened to them?' pile.